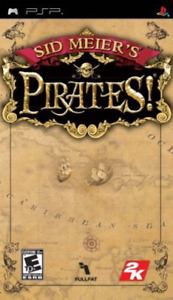 Based on the 1987 game created by Sid Meier, Pirates! Live the Life sails into the mobile arena armed with original features and an additional option for wireless multiplayer action. By selecting a starting year, nationality, and special talent, gamers are given a small group of men to captain and a large environment perfect for pillaging. Through diplomacy, force, and charm players can master the bounding main or die on the end of a British officer's sword. Gamers will find themselves attacking merchant ships for gold, food, and goods as they sail from port to port. When meeting with the Governor in bigger colonies, players can woo daughters with gifts and dancing. If interested, the maidens might shower gamers with rare items, a skill, or some important information. Other activities include dueling with enemy captains, treasure hunts, quests for lost family members, and sneaking into hostile towns. Using an Ad-Hoc connection, up to four players may sail the bounding main together. Every once in awhile, a game comes along that combines actions, adventure, comedy, strategy, and pure-silliness. Sid Meier's Pirates is one of those games. The objective of the game is to find your lost family members while traveling throughout the Carribean and pirate. Chose your lifestyle, be a cruel pirate going after all the treasure ships or be a buccaneer allied to a nation and play as an honorable captain. There are plenty of mini-adventures to keep you busy, from looking for lost treasure to dancing with the governors daughter in hopes of winning her heart. The dancing is simply silly but is quite fun as you either dance like a star or stumble all over the place. This can get a bit tedious over time though. It's easy to get into this game for hours at a time. You don't want to put the PSP down until your crew begins to mutiny and you have to start with a fresh one. There are so many little quests to keep you occupied, you could easily, and I mean real easily, keep going for hours. There are not many games that can keep your attention and make you want to keep going back for more. Highly recommended, go get your now. This was even better then I thought it was going to be. This is the kind of game that you can plug a lot of time into, leave it alone for awhile and then comeback and spend more time on it. You can do many things from sword fighting, to outfitting your ship, be a pirate, attack pirates, attack everyone else, raid towns, sell stolen/bought goods, dance with the mayor daughter, get married etc etc. all while completing your main quest of revenge against your family (and rescuing your lost/captive family members along the way. The game is really well done and the cut scen animations are nice if not a bit repetitive. The worst thing about the game is that the wind always runs east to west and so ship travel is really hard going against the wind and takes forever, a minor yet valid complaint. Give this one a shot if you need something to take up some time (on a trip), want something to play in between beating all those other games, or just want to try the best pirate game out there. Expect to pay $20 plus on a used copy and $35 plus on a new copy- this game is in high demand. I bid on like 20 of them before I got one for my price. Pirates is unlike other game on the psp. Not only do you get to play the part of a pirate (who wouldn't love that?) but the various difficulty levels are accurately set to challenge even the greatest of players. One of the greatest parts of this game is how open-ended it can be. Although the game ends when you inevitably grow old and retire, there are many side quests to keep you entertained for hours. There is also a main storyline to follow but that is up to the player as to how important it is to complete. Whether you are chasing after the top 10 pirates, looking for lost civilizations/buried treasure, wooing the governor's daughter with dancing skills & gifts, or mobilizing your forces to overtake a city, you are guaranteed to have fun. I have always enjoyed Sid Meier games but this seems to fit the psp well. Instead of overseeing massive armies or technologies like Alpha Centari or Civilization, you can partake in the many side quests depending on how much time you have to dedicate to this game. Pirates is entertainment for hours on end and is even fun playing again and again. It is also worth noting that I hardly EVER replay games once I've beaten them. If you haven't tried this game, I highly recommend it. You'll always find new strategies to test and new goals to set for yourself to complete. The only drawbacks that I can find is the lack of a co-op multiplayer & a glitch where the barkeep/waitresses will always say that the Treasure Ship is heading to a port which isn't true. They are only saying where the ship started. They will not accurately report where it is after the first time it is mentioned. There can also be an occasional video glitch (ship flies across the ocean much faster than is humanly possible). But considering how much they managed to fit onto the UMD...I'll deal with the glitches to have hours of entertainment! If you like the various other version of Sid Meier's Pirates, here's one more to love. It's probably 95% of the latest version to hit the PC and XBox, and the stuff that's missing is hardly noticeable. This game is perfect for the PSP...it's a game you can spend hours at a time playing or you can go pick off a few Spanish galleons, find some buried treasure within 5 or 10 minutes, then put it down for later. It's incredibly open ended, pretty much giving you complete freedom to explore the Caribbean in the last 17th century, but you can also follow the storyline and hunt down villains and rescue your long lost family. With the number of options available, the replay value is pretty awesome, also...be an English privateer this time, sail under the Spanish flag next time, confine yourself to attacking other countries only when you're at war, attack everything in sight and escape to the safety of a pirate haven, the possibilities are endless. With literally 100 possible endings, depending on how grandiose your exploits were, there's plenty to keep you coming back for more. No joke, I have played the various versions of this game for probably thousands of hours over the years, dating back to the 90's with the original Pirates!. The PSP version is just more of that goodness. Tons of fun, easy to play for most ages, and a great way to waste time. I use to play this game on the XBOX so I am thrilled to see it on another platform. Becoming a pirate, having free range to do as you like, and really make the adventure your own sets this game apart!